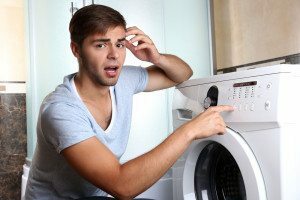 Washing Machine Temperature: Is Cold, Warm or Hot Best? Choosing the best washing machine temperature ensures that your clothes, towels and other items are consistently clean. It can be confusing to know whom or what to believe — the recommendations on your clothes labels, the instructions on your detergent, the information that came with the washer and the stories you hear from friends or in the media. Following is a rundown on the best temperatures to use in your machine. According to industry experts, three factors determine how clean your laundry gets, and all three need to work together effectively in order to remove soil. The first is the mechanical action of the machine, including the vibration and rotation in the tub and how long each cycle lasts. Next is chemical action, which comes from your detergent, bleach and other additives. The third is the wash and rinse cycle temperature. If the balance of these three components is right, your laundry will be sparkly clean. If one component wanes, the level of the other two must be increased to make up the difference. What this means in practice is that if you use cold water, then you must increase the amount of detergent or washing time. The reason is that for each 18 degrees the temperature rises, the speed of the chemical reactions of the detergent doubles. Colder water directly equates to a slower cleaning speed. To help you simplify the process, read on to find out how to choose the right temperature for different types of laundry. Hot water is a must if you are washing diapers, whites and heavily soiled clothing, like kids’ jeans or work clothes. This helps to get rid of germs and deep-down dirt. The right temperature for the hot cycle is 130 degrees or higher. This can be a problem for many households because water heaters are often set to heat to only 120 degrees, to save energy or for safety. If that’s the case and you don’t want to change it, simply use the hottest temperature available to you. Be sure to check the labels on your clothes before using hot water, as it can shrink cottons and other fabrics. It can also cause them to fade, and even damage some delicate clothing. Man-made fabrics do well with warm water, about 90 degrees. This temperature will banish most dirt and stains, with the added advantage of not fading or shrinking your clothes. According to the American Cleaning Institute, presoaking heavily stained items lets you get many clothes clean at a warm, not hot, temperature. Cold water, which is a temperature of 80 degrees or less, is the most energy-efficient choice. Unfortunately, it is not effective for all types of clothes. It works well for bright and dark colors that have a tendency to bleed. It is also the best choice for delicate fabrics because it doesn’t cause shrinkage or fading. For heavily or moderately soiled items, however, it’s not ideal. Always pretreat heavily soiled clothes if you plan to use a cold water wash cycle. You will also need to use more detergent than usual to get your clothes really clean, and use the longest washing cycle on your machine. If you try to go really cold, at a temperature of 60 degrees or less, you probably won’t get your laundry clean at all. The detergents simply don’t perform well when it is that cold. This means that during the cold winter months, you’ll have better results with at least a warm water wash cycle. Cold, warm or hot: the right temperature depends on the fabric and how dirty it is. Choose the right one to make the best use of your washing machine. Contact Complete Appliance Repair of northern Utah for help with service, repair and maintenance of your washing machine and other home appliances. This entry was posted in Blog and tagged Washing machine maintenance, Washing Machine Temperature on July 21, 2015 by admin.